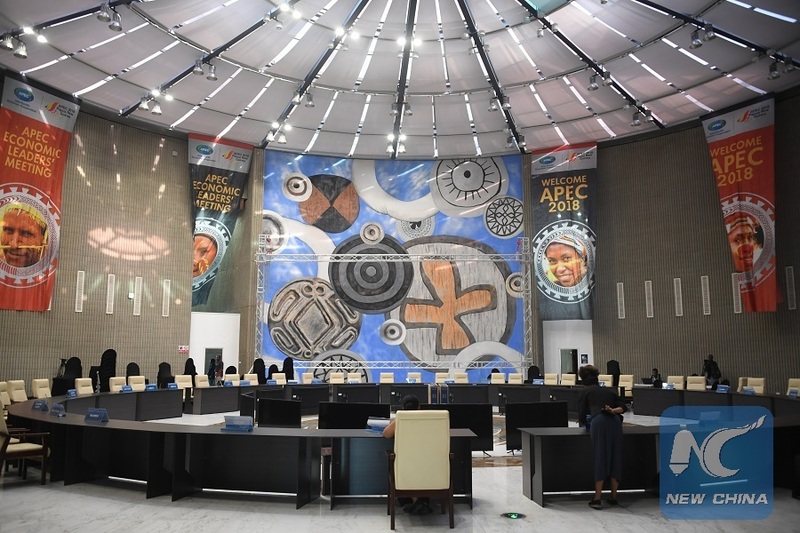 PORT MORESBY, Nov. 14 (Xinhua) -- The International Convention Center where APEC Senior Officials' meeting was held here was a building with distinctive Papua New Guinean (PNG) style. The pillars bear carvings of PNG traditional patterns, while the big meeting room at the center is decorated with tribal totem. But taking a closer look on the exterior wall one could find a red sign "China Aid." 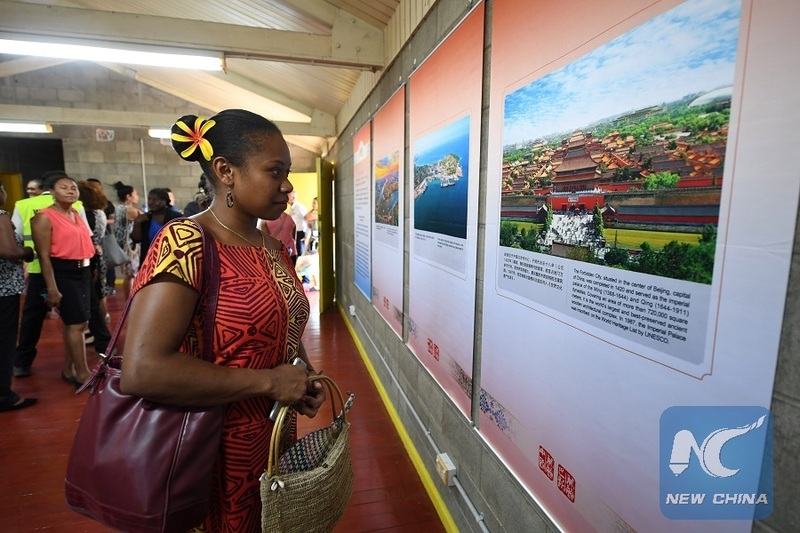 According to local newspaper the Post-Courier, China has spent 70 million kina (about 21.2 million U.S. dollars) to build the center, which was opened in 2016. The Chinese government later gave 20 million kina (about 6.1 million U.S. dollars) to the PNG for its maintenance. "I quite like this center," said Paul Kasokason, Meeting Rooms Coordinator. "It is quite comfortable, with modern facilities including remote functioning equipment to control light and projection." "China helped us a lot in the modernization of Port Moresby," he said. Apart from the convention center, China also funded for six-lane highway in Port Moresby between the convention centre and the nearby national parliament, among other projects. While walking in the APEC venues, Xinhua reporters also met with smiling local people who tried to speak some Chinese words to show their affection for China. Amanda Tau ran a handcraft booth in the APEC 2018 International Media Center. Three of her cousins are in China, working or studying. She had planned a trip to China and asked if she could browse the photos to see China's scenery. "China gave us a lot of aid," she said. "I can see Chinese people running business everywhere." The 28-year-old owner of Pacificana said Chinese businessmen gave her some good advice. "The Chinese are among the most successful businessmen," she said. "They work together and help each other." Sharon Dua also expressed her gratitude to China's aid. The 23-year-old student is a volunteer in the International Media Center, who approached Xinhua reporters to ask voluntarily if she could help by hailing a shuttle bus. "I am thankful to China," she said. "A road here was built by the Chinese government." Davara Uru who worked in the Stanley Hotel & Suites has great interest in the Chinese culture. To prepare for the APEC, she learned not only some simple Chinese expression, but also Chinese culture and etiquette. "China has deep culture which has never faded, and people are proud of that," she said. Chinese student Wu Jingru came to Port Moresby five years ago, where she saw the number of Chinese people increasing. "There are more shops now," said the 19-year-old girl. 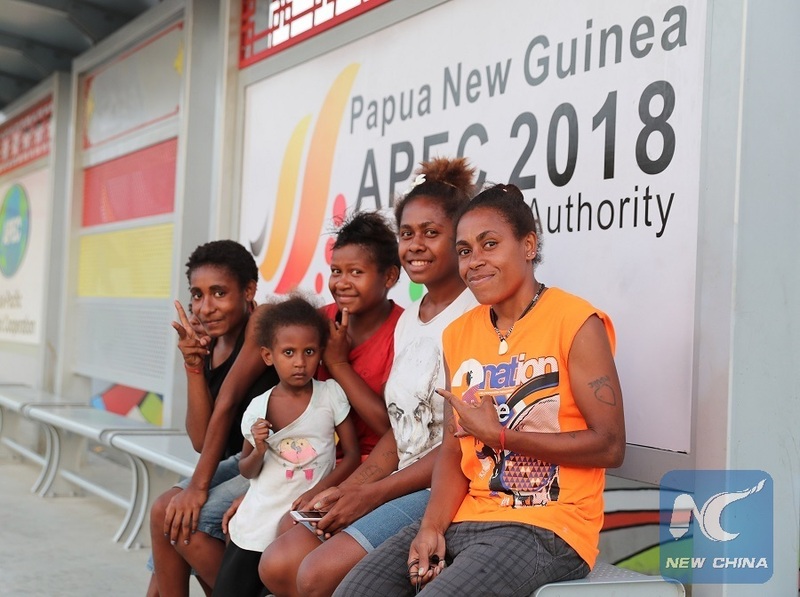 With more interaction with the Chinese, Papua New Guineans are now increasingly interested in China. Kasokason planned to travel to China after APEC. "I will first go to Beijing," he said. "It will be good if our countries could maintain this relationship."